KNEEL! You have reached GeneralZod.net | Zod on "Valentine's Day"
Inhabitants of Planet Houston. Slaves of Zod. 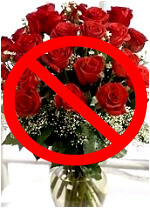 It has come to my attention that many of you have been preparing to celebrate a human emotion known as "Love". I have heard that this celebration is called "Valentine's Day" and that it is filled with all sorts of unnecessary luxuries that I did not give you permission to enjoy. And what is this "love" you speak of anyway? Before killing a defiant slave for not kneeling before me, I asked him the question "What is love? How does one show it?" He claimed that it was a human way of showing that you care for another person. Like pets I suppose. Furthermore, he explained to me some of the ways that you humans express this "love" to one another. First there is the exchange of "flowers", a most peculiar ritual. You humans actually rip flowers from the ground, the same plants that provide you with your life-sustaining oxygen, and give them to your loved ones? Why is it that you choose to give your loved ones the carcasses of befallen vegetation? Is this love? Perhaps I am beginning to understand and even relate to it after all. The way to express your "love" for someone is to demonstrate that you are willing to kill another life form for them. Then there is the issue of chocolate. 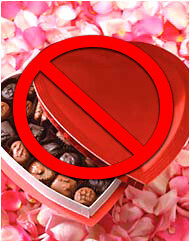 According to some, if the human emotion "love" could be collected and stored in an edible morsel, it would be chocolate. I went to one of your "stores" and took one of these "Whitman's Samplers" into my hands. Upon opening the box, I not only discovered chocolates, but I discovered a guide which informed me about what was contained within them. These unhealthy chunks of chemicals are how you show your "love" for each other? Pathetic. If you truly loved one another, you would tear out your own hearts and exchange them. From my obviously correct perspective, "love" looks a lot like gluttony to me. While I am sure eating all of this "chocolate" would help you gain weight so that your knees would have more cushioning to rest upon while you kneel before me, it is not something I approve of. Your kneeling shouldn't be a "cushioned" experience, it should be painful. Because if you are willing to suffer to prove your allegiance to me, then that is the only way I will allow you to live your life as one of my loyal slaves. But fear not my slaves, for I believe I have found the cause of this vile disease known as love. After much research, I discovered that there is a disrobed defiant minikin-creature known as "Cupid" who flies across the land. And while I see you are practiced in worshipping things that fly, the only flying being on this planet that you need worship is Zod! 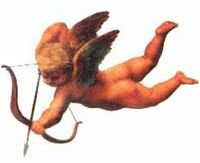 According to what my studies have shown, this "Cupid" flies around and shoots people with his arrows so that they may fall in love. While arrows may break the skin of your fragile bodies, they can't possibly stand up to my eye lasers! Therefore, I have decided to kill this "Cupid" and take his place. DIE AS YOU DESERVE TO, WEAK-WILLED LOVERS! If you wish to "fall in love" with another slave, then so be it. I will shoot you just as Cupid would. And as your bodies turn to ash as a result of my eye lasers, your last thoughts should be about how you "loved" being a slave for Zod in your short and utterly meaningless little lives. I do not love you. I rule you. I "love" to rule you. And the great General Zod will not hesitate to kill any of you to demonstrate this love. Never forget that. Now that you understand your ruler, I will permit you to enjoy a true "Valentine's Card".